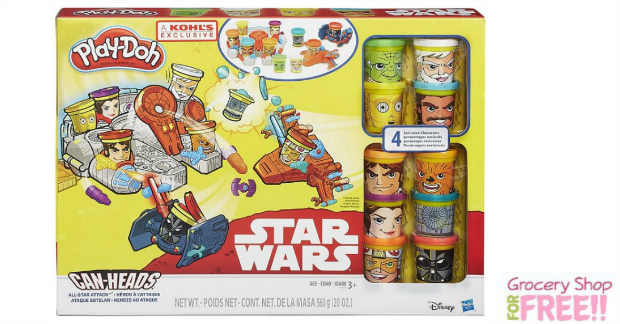 Play-Doh Star Wars Can-Heads All-Star Attack Set Just $5.99! Down From $50! You are here: Home / Great Deals / Christmas Deals / Play-Doh Star Wars Can-Heads All-Star Attack Set Just $5.99! Down From $50! Play-Doh Star Wars Can-Heads All-Star Attack Set Just $5.99! So, this would be a great deal to fill your gift closet with! You can get this Play-Doh Star Wars Can-Heads All-Star Attack Set for just $5.99! It’s on sale for $9.99 down from $50! But there are a few coupon codes you can use to make it just $5.99! You can also get fr: shipping on purchases of $50 or more. Create an epic Star Wars battle with Han Solo piloting the Millennium Falcon and Luke Skywalker and his X-wing fighter, battling the dark side and Darth Vader in this kit from Play-Doh.